Phyllis has been the League’s Most Valuable Player for much of its history, a combination of Lance Armstrong, the Energizer Bunny, Encyclopedia Britannica, and Winston Churchill, all rolled up into one indomitable spirit. What words would do justice to her extraordinary zeal for life and her selfless devotion to the League? “Daring”, “adventurous”, “generous”, “indefatigable”, “enthusiastic”, “unique”, “passionate”, “dauntless”? The only way to even attempt to capture Phyllis’ spirit and her boundless energy on paper is to share some of her exploits and her deep dedication to bicycling and the League. Phyllis has loved bicycling since childhood. She bought her first bike, a red Ernie McKay Special, on her 12th birthday with $28 she had saved from babysitting. “My Dad said if I could ride to the corner and back, I could have it. I had to balance myself by holding onto a drugstore awning rod when I turned around, but I made it, ” she recalls. By 15, she bicycled 80 miles to Wisconsin on her own, In 1937, Phyllis joined the League as a charter member of the Evanston Bicycle Touring Club and immediately became a volunteering force in the organization. She took on the job of editing the Bulletin, then on its sixth issue, while raising her six children and working at a bank. Phyllis and the League persevered during the years of World War II. Phyllis kept up with all the APO address changes and the Bulletin was sent overseas. She was delighted to receive enthusiastic letters from League servicemen saying how much they enjoyed reading the Bulletin in their foxholes and tents and on ships all over the world. From 1936-1955, Phyllis was very active in the League of American Wheelmen (as the organization was then named). In 1964, the state of Illinois notified the League that, due to nine years of inactivity, the League's bank funds would be taken over by the state. 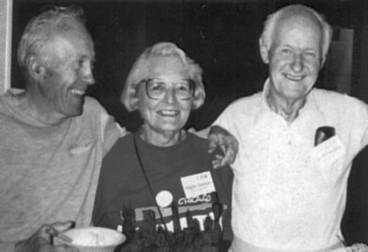 Past president Joe Hart invited former League members to a dinner; the enthusiastic response of the 250 cyclists in attendance inspired Phyllis, Joe Hart, Keith Kingbay and Ed Collier to reorganize the League. 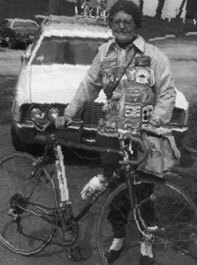 In 1965, they invited cyclists from all over the country to participate in the 25th anniversary of the Columbus Wheelmen in Chicago. This resulted in the League of American Wheelmen, once again, becoming a national organization. After the League’s revival from its 1955-1964 dormancy, the organization began to expand again. The Bulletin, which Phyllis still produced at her house, grew to 32, then 48 pages. In 1972, Phyllis became the League’s first paid employee. In 1973, she became executive vice president and moved production of the Bulletin to the League’s new headquarters in Palatine, IL. With the departure of the League’s executive director in 1975, Phyllis added the duties of this position to her editing work in what was to be a temporary arrangement that somehow lasted four years. Phyllis has been deeply involved for 66 years with the League-more than half the time the organization has been in existence. 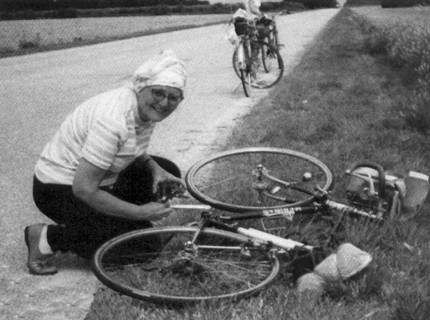 In 1979, Phyllis received the third Dr. Paul Dudley White award-the League’s most significant honor, which recognizes outstanding contributions to bicycling. She said, “I’ve devoted much of my life to making the League a success, and hope it continues to be the best organization for bicyclists.” In recognition of her selfless work for bicycling and for the League, the Phyllis Harmon Volunteer Award was established in 1985 to recognize individuals who have made extraordinary contributions to better bicycling on a local, regional or national level. 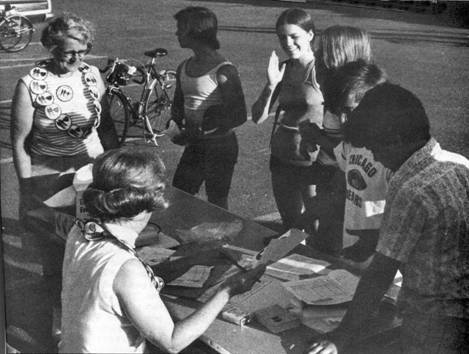 Phyllis herself provided much of the impetus to revive the organization and served its members, as historian, treasurer, executive vice president, and editor of the Bulletin (now League of American Bicyclists magazine). She was solely responsible for the publication of the Bulletin for some 21 years. When Phyllis retired from her position as editor in 1979, the League’s then president Pete Kutschenreuter said, “During her tenure as our editor, neither rain, snow, Saturdays, broken wrist, dog bite, or illness kept her from getting out our Bulletin at press time.” Phyllis retired when the League offices moved to Baltimore in 1979 and she became honorary director of the board. She regularly drove alone for over twenty hours at a time from her home in Wheeling, IL to attend League board meetings, “swinging by” her daughters’ homes in Texas, Florida, and Arizona along the way. Her persuasive speaking skills, incisive writing sharp wit and photographic memory kept the Board on its toes for many years. Never one to shy from adventure in cycling or other athletic endeavors, Phyllis celebrated her 70th birthday by tow gliding in Arizona and her 73rd by riding on the League’s “Pedal For Power Across America” from Los Angeles to Boston in seven weeks. At 75, she soared over Phoenix in a hot air ballon, and at 77, donned a wet suit for a white water rafting trip in New Zealand. Decades past the age when most people are content to spoil their grandchildren, play golf, watch TV, and daydream of past glories, Phyllis rode her last century at 74 and led her sixth three-week cycling tour of New Zealand at 83. Though she was an avid six-day bicycle race fan, Phyllis had never actually raced herself until, at age 73, she won three gold medals and a bronze in the Illinois and Arizona Senior Olympics. The following year, competing in the Yoplait 50-Kilometer Bicycle Challenge on a fully loaded touring bike, she competed with racers riding stripped-down racing bikes-and brought home the yellow jersey. Now, 86 years old and 3 1/2 inches shorter, Phyllis can no longer fit her bicycles. But with a new Paramount mixte-frame bicycle on the way, she’ll soon be back on the open road again.